Ah autumn, such a beautiful season, leaves turn brown, yellow and starts to fall off. And it’s colouring our Streets. Well just like those trees losing their leaves, I’m losing my hair or that’s what it looks like. Every time I brush my hair it looks like a small wig is coming off. So I asked my hairdresser if this is normal because I’m starting to worry. She reassured me that it’s completely normal at this time of the year. But still I was curious if there was something that could give my hair a boost. And then I found ‘Ikari daily H shots’, well it found me actually. We were at a beauty event and I was telling my story and someone from Ikari said she could help me boost my hair. She told me to take 1 capsule per day (because I already have a lot of hair) and you’ll see for yourself that your hair will look and feel stronger. 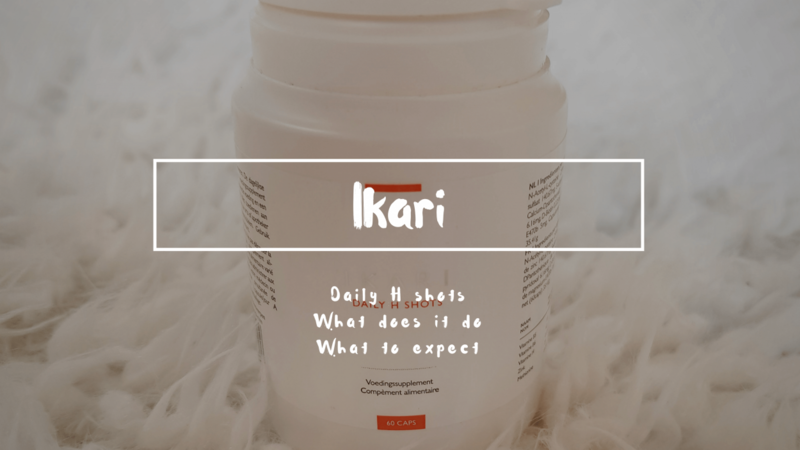 For who is Ikari daily H shots capsules are good for. Okay, and what can we expect? Fuller and healthier looking hair. But what’s inside that helps against all the above? So of course I had to take it to the test, first see and then believe is what I always say. Once a day with a glass of water. Days went by and in the mean time I had my hair analysed, they said that my hair was healthy and my hair routine is fine. Short before taking these capsules I went to the hair dresser and now I have light bangs so to fresh those up I expect to go do them in 2 months or so. Okay I’m going somewhere with my story. So after having them only 3 weeks I’m starting to get annoyed by my bangs because they’re always in my eyes and I’m thinking to make an appointment for my hair already. Then it hit me, my hair was growing a bit faster. And now I’m paying attention to my hair and noticed that I have baby hair sticking out. I have to admit that it does what it says. Even my nails got stronger and growing much faster. So I’ve tested it and I liked it, it sure does give that extra boost which I needed. Ik heb ook best last van mijn haar, dus ik ga deze zeker eens uit proberen.